Yes, they really said that! The comment was flipped my way during a particularly busy month. I’d been nominated as a finalist in an award recognising women entrepreneurs, my business had suddenly taken off with a new client on my books and I was working hard on getting my new book finished (more on that further down). Yes, I was busy, but my kids weren’t suffering and in fact, my 14 year old couldn’t wait for me to go out so he could babysit and earn some cash. The inference in that comment was that I was neglecting my kids because I was working on building my business. I could have let a comment like that eat at me, but instead it fired me up. Why shouldn’t I expect to be able to build a business while still meeting the needs of my kids? Why shouldn’t I aim high and go for my dreams? Women no longer have to choose between career and family. It’s, quite frankly, absurd and outdated to suggest that women can’t create an entrepreneurial life because they are mothers, because they are carers, because they are single mothers. Absurd! So, I hope you’ll understand why I’m so passionate about changing perceptions and helping women be all they can be as they leave behind the corporate ladder and create their own businesses. For too long now, that “have your cake and eat it too” attitude has prevailed, and women are left feeling like they have to choose… between career and family, and between workaholism and a life they love. Why should we have to choose? Well, the good news is… we don’t. Let me be clear on where I sit on this… Forget having your cake and eating it too. Take over the whole damn cake shop! 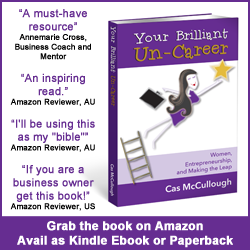 In my new book, launching on Dec 2nd: Your Brilliant Un-Career: Women, Entrepreneurship, and Making the Leap, I challenge the status quo about the choice myth and reveal a roadmap paved with my own experiences, blood, sweat and tears, as well as the experiences of 20 other women entrepreneurs from Australia, the US and UK. If you’re curious about the title, the answer is “Yes”, the book title was inspired by Miles Franklin’s classic work My Brilliant Career. While my book is about entrepreneurship (and by the way, fellas, you’ll probably love it too…at least that’s what the men who’ve read advance copies have said), it is also about encouraging women to do their dream into being, to take action and make the leap so they can life more fulfilling lives, and create their own brilliant, unique paths to success, to lead the way in changing the way we work and the way success is defined. This book is the culmination of three years work, three years of soul searching, trial and error, and documenting my own path. In that time I have grown a fledgling solo marketing consultancy into a successful boutique agency with a team of 11 supporting me on a project-by-project basis. We are proving that you can have the cake shop because we’re showing how it can be done. I’d love to show you too. If you’d like advance notice of the book launch, so you can nab your FREE copy on launch day, I invite you to sign up for my early notifications email list. Women can have it all. Don’t let anyone lead you to think otherwise. There is a roadmap… it is on it’s way…. and it just might transform your life. I’ll let you know more details about the book launch and how you can get involved soon. I totally agree with you, I am a small business owner and a mother. I am not neglecting my daughter I am teaching her that she can do whatever she wants to do and be whoever she wants to be. I’m teaching her to follow her dreams and not allow other peoples opinions direct her decisions and what she wants for her life. Go mama you are doing an amazing job! I’m sure your kids are incredibly proud of you and will be more so when they are parents themselves!